Provide values for basic system configuration when prompted. The installation process terminates with a warning if the environment does not meet any of the system requirements. You can try launching installation again after you fix the reported issue(s). If any problem occurs, you can see the details in app/logs/oro_install.log file. After the installation finished remember to run php app/console oro:api:doc:cache:clear to warm-up the API documentation cache. This process may take several minutes. Please refer to the oro:install command help for more information on the parameters. Use –sample-data=y only for learning purposes, test deployments and pre-production deployments. In this mode, Oro application is populated with sample data that help you unlock all the features so that you can quickly test the system after re-configuration or customization. The installation process terminates with the warning if the environment does not meet any of the system requirements. You can try launching installation again after you fix the reported issue(s). Click Begin Installation on the Welcome to Oro Installer screen. 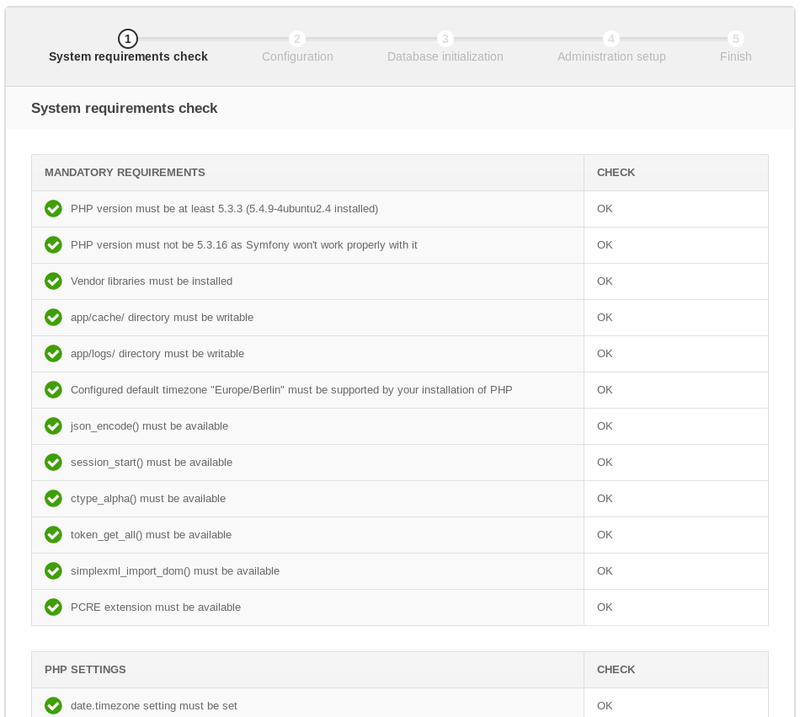 Ensure that system requirements are met (status indicators should be green for all items) and click Next. The application configuration page emerges. 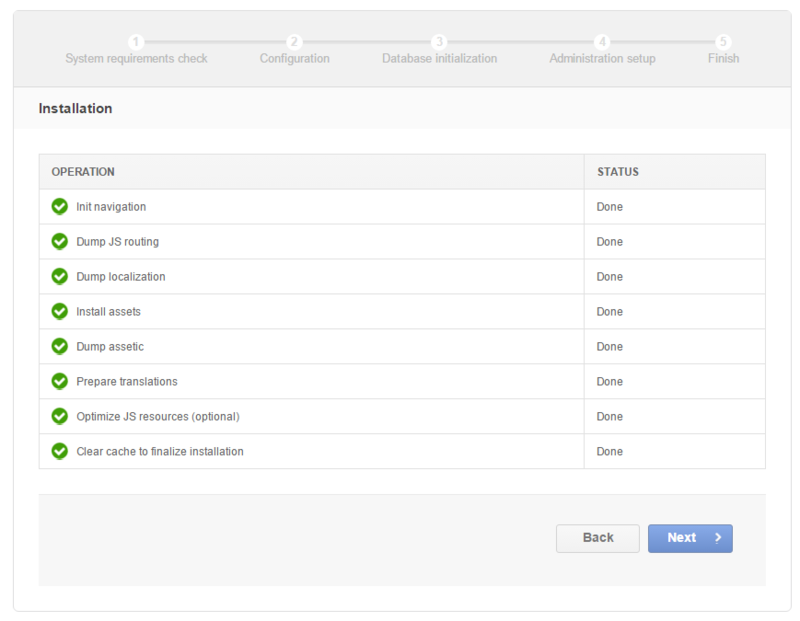 The values defined in the configuration parameters will be filled in automatically, but they can be changed. 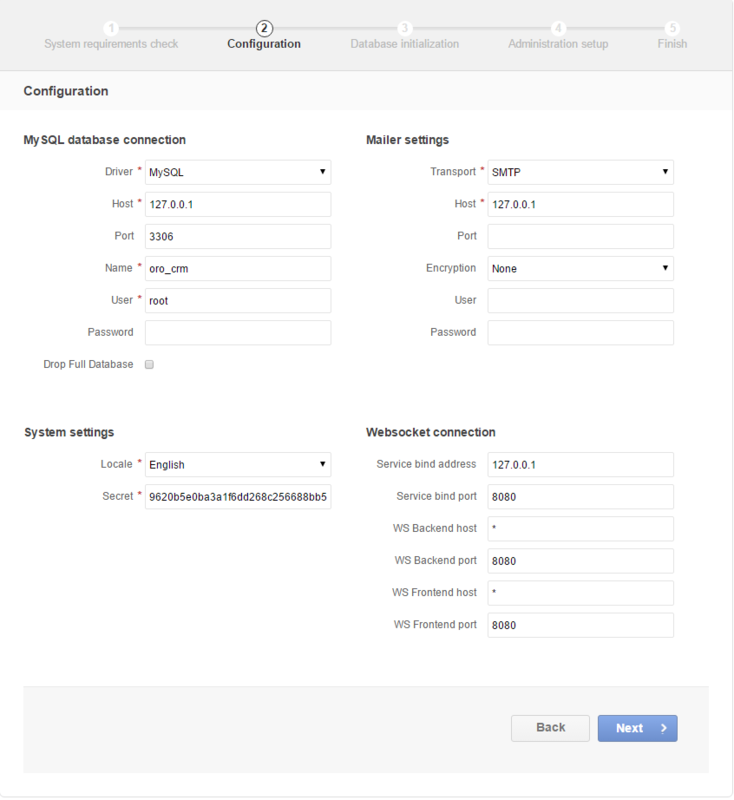 enter the database name (Name), user name and password for OroCRM authentication with the database server. For re-installation, specify whether OroCRM should remove the existing database table contents. Available options are None, Application Tables, All Tables. The default value is None. In System settings, specify the system language and the secret for OAuth 2 client authorization. 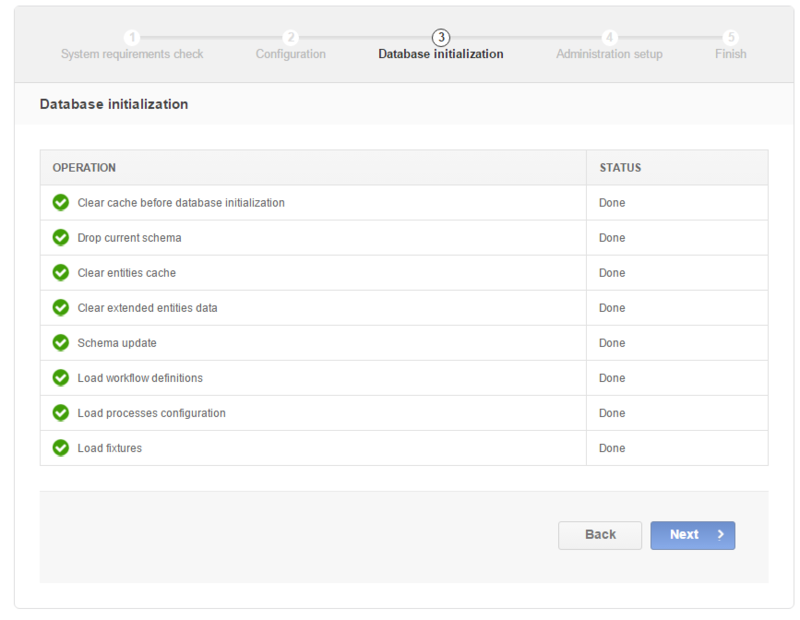 In Web settings, provide the prefix that will be attached to the application URL to access the OroCRM configuration and administration application (backend). In Mailer settings, select the transport for the emails OroCRM will be sending. Available options are PHP mail, SMTP, and sendmail. When you select the SNMP, please, provide the following mail server connection details: host, port, encryption (None, SSL, TLS), user name, and password. In the Websocket connection, set up your web service network configuration: service bind address and port, WS backend and frontend host/post. Once you are happy with the information you have provided, click Next. The Database initialization starts automatically. Click Next when status turns green for every step. Create the first system administrator by providing a user name, a password (with confirmation), an email, and their first and last name. If necessary, select the Load Sample Data check box. Load Sample Data only for learning purposes, test deployments and pre-production deployments. In this mode, OroCRM is populated with sample data that help you unlock all the features so that you can quickly test the system after re-configuration or customization. Finally, click Install and wait until the status for all operations turns green. If something goes wrong and a failure occurs, you can check error logs in the app/logs/oro_install. Fix the errors, click Back and repeat the installation step. Once installation is complete, click Next. 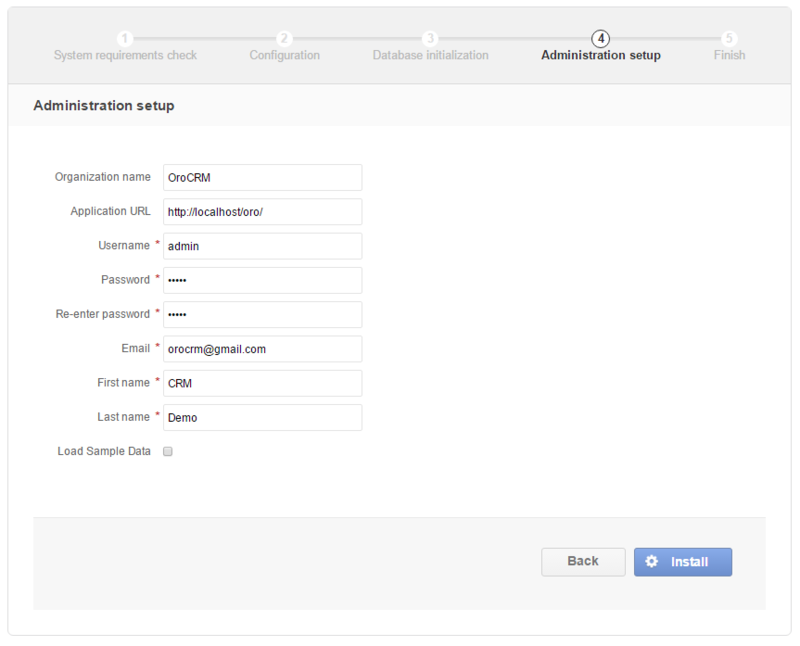 At the Finish step, click Launch Application to open the OroCRM Administration Login screen. The URL will be similar to the following: http://<hostname>:<port>/app.php/admin/user/login. To log in, use credentials you provided for the first system administrator.